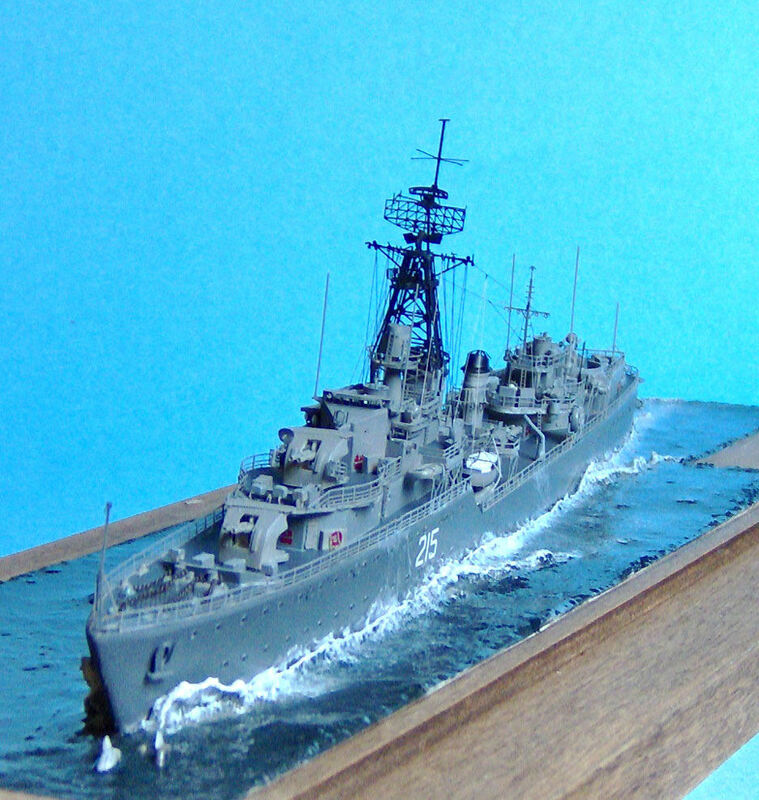 The British realized in the 1930’s a better destroyer design was required to maintain parity with other nations, a ship with better armament, speed and longer range. The Tribals were designed to meet all of those needs and were certainly a welcome addition to the fleet. HMCS Haida was one of 27 Tribals built, the forth for Canada, and commissioned August 30, 1943. Haida’s name comes from a very distinctive and powerful maritime native people of British Columbia, Canada. Her long and distinguished career, covering two wars and a reconfiguration, are noteworthy. Haida was known as the “Fightingest Ship in the RCN”, sinking 14 enemy ships and serving two tours of duty in Korea. The kit represents Haida in her 1956 configuration, including alterations that were carried out in 1949-1952. The year of completion was also the middle of the Korean war and once again Haida was called to duty. Sailing South from Halifax, through the Panama Canal and on to Yokosuka, Japan via Hawaii. This was the first time Haida had sailed the Pacific. On June 8 Haida was relieved and it was back home for a refit in Halifax, Nova Scotia. In the fall of 1953 Haida was once again heading back to Korea for her second tour, this time the beginning of the armistice. The final years were spent exercising off Bermuda, in the Caribbean, across the Atlantic and port visits in between, making her final cruise in the Great Lakes during the summer of 1963. HMCS Haida paid off in October 1963 and moved to Toronto, Ontario where she was turned into a museum. Parks Canada acquired Haida in 2002 and before the ship was moved to the city of Hamilton, Ontario, $5 million in repairs were carried out on her hull. Haida is presently part of the Canada maritime Discovery Center, Hamilton, Ontario, Canada. Resin Shipyards first 1/350 ship kit is very well done. After some teething problems for the new company the ship arrived in a very sturdy box with the smaller parts packed in small clear plastic flip top cases and the hull wrapped in bubble wrap. I requested a waterline cast and Darren will do this for anyone that asks. The resin in cast in a light tan color and all moldings were flawless with a bare minimum of tissue paper thin flash. The instructions are colorful and easy to read (even for those that may have to take their glasses off). 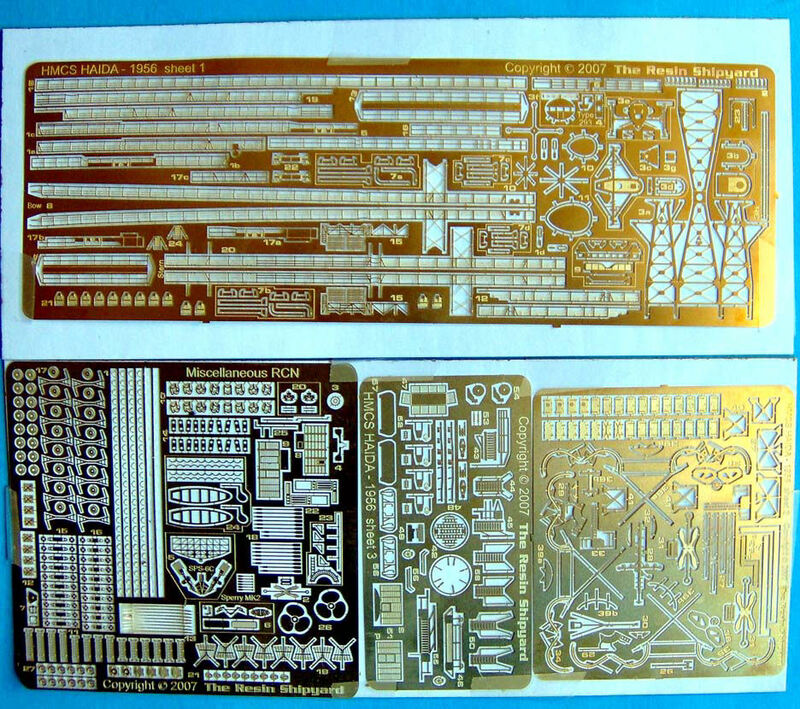 The star of the kit though is the photo etched parts. 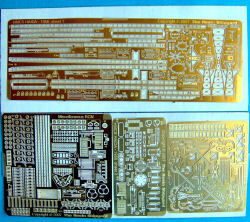 Very comprehensive and relief etched. There are some gimmicks thought that I’ll touch on later. Decal and marking/painting options are for Haida in either 1953 or 1956 with pendant numbers available for her sisters. Even with the complexity of the PE assembly is straight forward, however the assembly sequence should be carefully considered before you begin. Many details for the bulkheads and decks are not dealt with ‘till well into the instructions. In my opinion bulkhead and deck details should be completed first before the assembly of the mainmast, lifeboat davits and the like. I like to work from the inside out and from bottom to top. Several pieces of photo etch are for platforms either on the mast or jutting from a deck. In the spirit of innovation perhaps the supports for these are part of the piece and need to be both twisted and bent underneath top replicate the support system. In my opinion it just doesn’t work. When you twist metal toy get a “rotini” effect that creates a “knuckle” where the part was bent and twisted under. Even though it means more itty bitty parts separate supports are the way to go. My one pet peeve with this and many other resin kits is why do they mold a deck section with a structure setting on it to be sanded down and placed atop a lower structure level. Take the gun deck on this kit as an example. The one piece gun deck and main bridge piece sets atop the 01 level. As it was cast the bottom of the deck needs to be sanded to thickness then attached to the 01 level. Why don’t these manufacturers mold the deck into the top of the 01 level? Yes I know often there are overhangs that can’t be pulled in molded in this way but can’t any overhangs be cast as separate pieces? This would eliminate trying to sand the bottom of the deck perfectly flat. Sometimes there may be very nicely molded splintershielding or gun tubs on top of the deck that will inevitably get damaged while you’re trying to sand the bottom of the deck flat. When you’re finished you have to hope the thickness is correct so any photo etched ladders, stairs, or supports fit and you have a seam all around the lower superstructures top. Molding the decks to the lower superstructures tops would make for a cleaner build-in my opinion. Like I said this is just a nit pick on my part and effects the overall quality of this kit very little.